Obviously, the delay is a setback for the company. The otherwise very well-reviewed Samsung Galaxy S8 comes with a button specifically designated for Bixby, which is basically pointless at this juncture. The company already missed its first launch date for the English language product, which was supposed to hit in the spring. 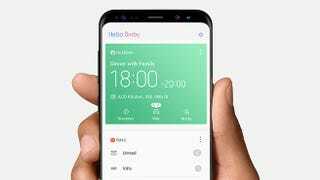 Samsung has yet to announce an official date for Bixby’s wide release in the United States, but the WSJ claims it’ll be by the end of the month. We reached out to Samsung for comment, and we’ll update if we hear back.